"This was the second game I hosted and played as a group. The year before, we played Way Out West. Everyone had so much fun ans asked us to host and plan another game the following year. My wife and I began thinking about what game we would play next and found Under the Big Top. We partially chose it due to the costumes and varied roles that everyone could play. It was much easier hosting a second game. The flow of the evening, planning, casting, decorating, preparation, and character management was much more easier once I knew what to expect. These are great games to play and use as an alternative to a 'standard' Christmas party with friends. We had people all over our house and at times had as many as four people crammed into a small laundry room for a 'secret' meeting! The game was a hit and have had requests for next year's game." "We played Under the Big Top on New Year's Eve -- it went brilliantly! I was quite nervous at first in case I had made a mistake preparing the envelopes. We were 16 players (I had downloaded the extra character) from 10 years old to 74 years old -- the 10 and 12 years old were brilliant doing the dirty deals with their fake money! We almost forgot midnight, so busy everybody was talking about the various plots (we had finished the game at 11.30pm!)" "I donated this Under the Big Top murder mystery party as a fundraiser for our local animal shelter. I have done this before. This time I got $3,700 for my murder!" "I hosted (on my own) again for the first time since 2008 Under The Big Top last Saturday and it was really good! I created Jo Jo's Emporium and added freaky props and fake spiders web to the walls plus playing cards tacked to the wall for an extra mini-game ;) I dressed as a mime as the circus-hand and very nearly won the best costume which I was very glad about! Well, that's six down and people are already talking about the seventh on the way… Thank you once again Freeform for a great murder mystery! :)"
"I couldn't help but think that I, as the host, was entirely unprepared for the Under the Big Top night. It seemed to me there was far too much to remember. Luckily, that wasn't the case at all, everyone really took to their goals and went fully for it. I kept having people tell me "don't end the game yet! I'm so close to achieving such and such goal." Even my shy friends picked up on it right away. It was an incredible way to spend my 30th birthday!" 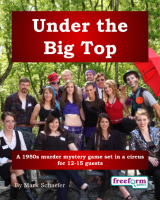 Under the Big Top is a dinner party murder mystery game for 12 to 15 guests and a host – download the free introductory pdf file. Join us in a thrilling evening of betrayal, deceit, treachery and circus mayhem. You will be in the middle of the action and it will be up to you to wheel and deal with the other guests. Can you achieve your goals, keep your secrets hidden and survive Under the Big Top? It's up to you. As the curtain falls on the final Big Top performance, a select few gather in JoJo Bones' Exotic Emporium of Enigmatica (part of the Bonanza). To celebrate the successful tour, JoJo will host a night of revelry, food, drink and, this year, what JoJo has promised to be "startling revelations". Tragically, however, JoJo was killed last night. His body was found early this morning in the lions' cage, mauled by lions Gladys and Mountjoy. Since JoJo's body reeked of alcohol, preliminary reports are that he wandered into the cage in a drunken stupor. Under the Big Top lasts for about four hours and is suited to an evening. It is often played over a meal – a finger buffet if possible to allow guests to circulate and talk in private. The free introductory pdf file contains an introduction to the game, a cast list of all the characters, and a copy of the Sarasota Star – plus details of how to buy the game. Alex Marbles – Our wizard of numbers (i.e. the accountant). Bo Bennett – Owner and ringmaster of Bo Bennett's Big Top Bonanza. Burt Butler – The fearless and intrepid svengali of the beasts! Dana West – Floppsy the Clown, our winning, whimsical and puckish prankster. Dimitri Korchencko – Flyer for the Flying Korchenckos, gravity-defying, soaring hawk of the trapeze! Frieda Laing – Assistant manager and mistress of the rides. Marvin Mancuso – The daring high wire performer and juggler par excellence! Mischa Korchencko – Astounding charmer of snakes. P.T. Connelly – World-renowned catering maestro. Quinn Bones – The human pincushion. Roxanne Bones – The Blind Seer will peer into your future. Stella Sue – Beguiling fire-eater. Svetlana Yuri – The human pretzel, a mind-bending contortionist beyond compare. Vladimir Korchencko – Dimitri's brother, and catcher for the Flying Korchenckos. Under the Big Top is unlike many murder mystery games. Although the game starts with a murder, most of the characters have more important things to do than to investigate it. And the killing may not be over – it is unlikely that everyone will survive the remainder of the evening! On the evening of the game the guests are met by the organizer, the Circus Hand. They then receive their detailed backgrounds – including dark secrets, objectives and money. Some are hatching schemes. Others harbor nasty and unbridled ambitions. The players can form alliances, blackmail each other, steal items and decide what they plan to do next season. Along the way they may solve some of Under the Big Top's mysteries. Who will be appointed the new Manager of JoJo Bones' Exotic Emporium of Enigmatica? What is the real story behind JoJo's death? All will be revealed Under the Big Top. Under the Big Top costs £20.00 (GB pounds) or US $29.99. You can buy it in either currency, from anywhere in the world, as you prefer. The price will be converted back into your own currency for you, at today's exchange rate. We offer a Cast Iron Guarantee on all our murder mystery games. If you're not completely satisfied with Under the Big Top then please let us know within 30 days and we will refund you. See our full terms and conditions here.